Microsoft wants to bring in your social networks under its roof with its new Live Messenger iPhone app. 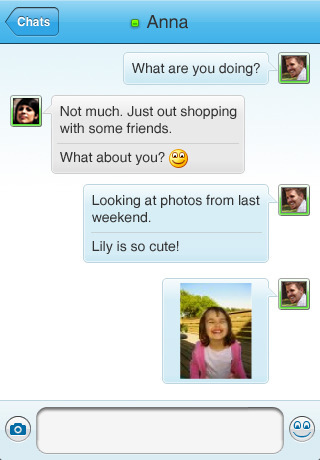 Windows Live Messenger for iPhone and iPod Touch is finally official and available for free in the App Store. With this free iPhone app you can check your Hotmail, IM friends, view and comment on your friends’ photos and status updates from Windows Live, Facebook, and MySpace, and at a glance, see what your Messenger friends are sharing from Flickr, YouTube, and many other social and photo sharing sites. – Send and receive Hotmail emails and get notifications when you have new messages. – IM using Windows Live Messenger, Y! Messenger, and more. – Update status for other networks including Facebook, Flickr and MySpace. – Take and upload photos to share from your iPhone. – There is no group chat support. – You can’t block or delete contacts. Up till now Windows Live Messenger users have been using either the web based version of MSN Mobile or 3rd party iPhone apps like Nimbuzz, IM+, Beejive, eBuddy, Meebo, Trillian and few others to chat on the iPhone over the Microsoft Live network. AppSafari review of Windows Live Messenger for iPhone was written by Joe Seifi on June 20th, 2010 and categorized under App Store, Chat, Featured, Social. Page viewed 11658 times, 2 so far today. Need help on using these apps? Please read the Help Page. This messenger is terrible I have no protection from spammers can’t even delete or block stalkersrs stick with ebuddy! b2k, try deleting the app then redownloading it. It won’t cost you anything and it might fix any problems that may come up during installation sometimes. If that doesn’t do it, try restarting your iDevice. Why i cant be online on my iphone ? It always says that my email add and password are incorrect but if i use my pc it always work..
What should i do, what appli should i download for me to have a msn messenger that work on my iphone ?? How come when I go to the App Store and type in “windows live messenger” and it’s not there? And when I click on the link here, it takes me to the App Store and it’s says that the app is currently not available in the Canadian App Store? Somebody please help, I need windows live messenger!